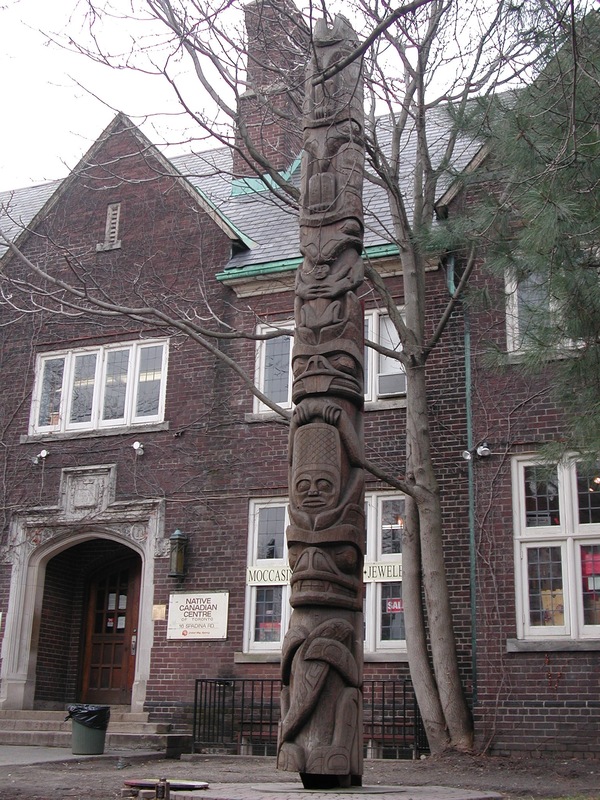 The Native Canadian Centre of Toronto (NCCT): A brief outline of the NCCT’s history. The NCCT’s Current Location On Spadina. 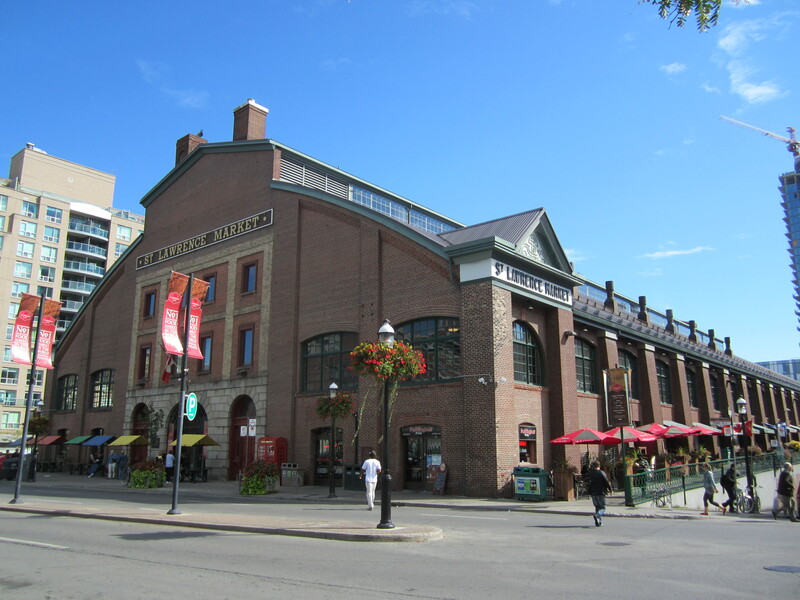 The Native Canadian Centre of Toronto has been a social, recreational, spiritual and cultural hub for Aboriginal people living and working in Toronto for many years. By offering a wide range of programs and events to community members, the Native Canadian Centre of Toronto is a successful gathering place for Aboriginal people and agencies in Toronto. The Centre’s programs and events include: indigenous language classes, beading workshops, children’s arts and crafts, weekly big drum socials, martial arts, youth and cultural programming, and the Toronto Native Community History Program. The Native Canadian Centre of Toronto as we know it today is the product of years of work by dedicated individuals who have truly succeeded in creating a meeting place for Aboriginal people in Toronto. After WWII, many Aboriginal people were migrating to urban centers in search of better opportunities such as employment. Aboriginal people who enlisted in the military, opened up off reserve businesses, traveled outside of the country, sought out higher education, and women who married non-Native men lost their status and were largely forced to move off reserve. Due to the nature of most jobs available to Aboriginal people in the city such as factory or private residence work, many were isolated from other Aboriginal people. 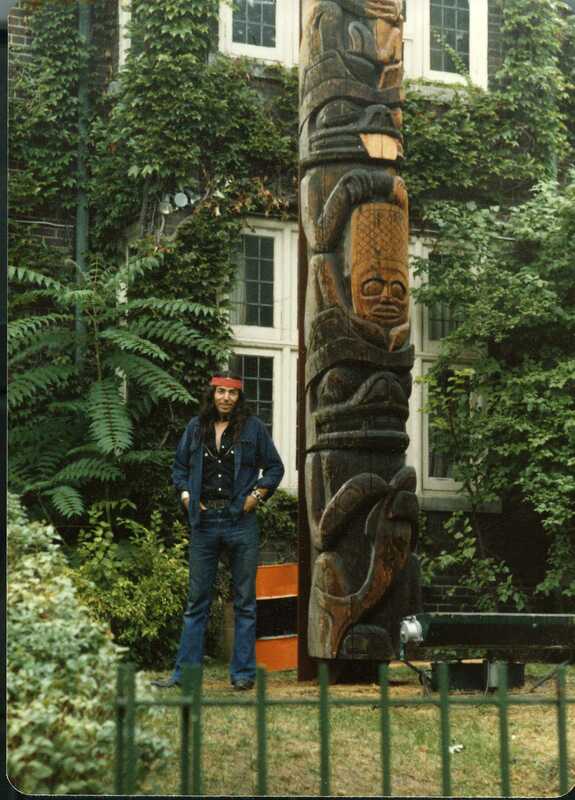 The North American Indian Club of Toronto was founded by a group of dedicated volunteers. The goal was to bring together Native people in the city to eliminate the isolation that many individuals felt. The Club’s first space was at the YMCA at Yonge and College streets in the 1950s providing them with a space for social, cultural and recreational activities. The North American Indian Club of Toronto hosted meetings for Aboriginal people in the city at the YMCA and began fundamental programming such as the annual Children’s Christmas event that still runs each year. By 1962, club members felt the need to have a community centre of their own. 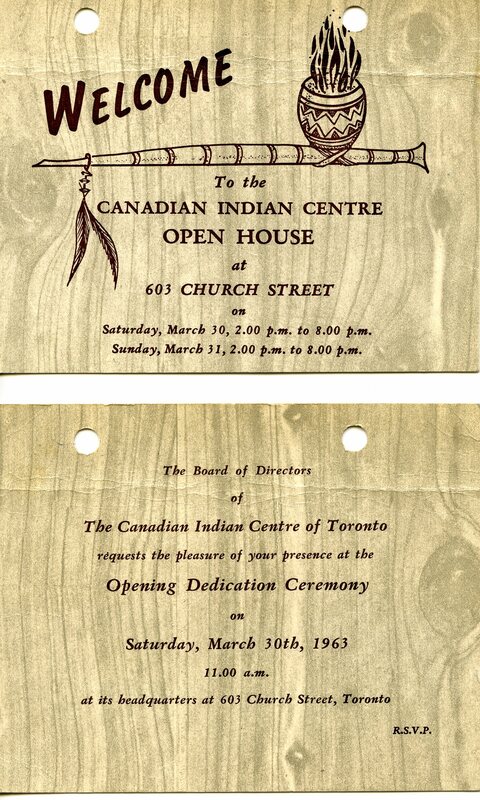 On April 4 of that year, the Canadian Indian Centre of Toronto received its patent letters of incorporation in preparation for finding a space and continuing on the NCCT traditions. 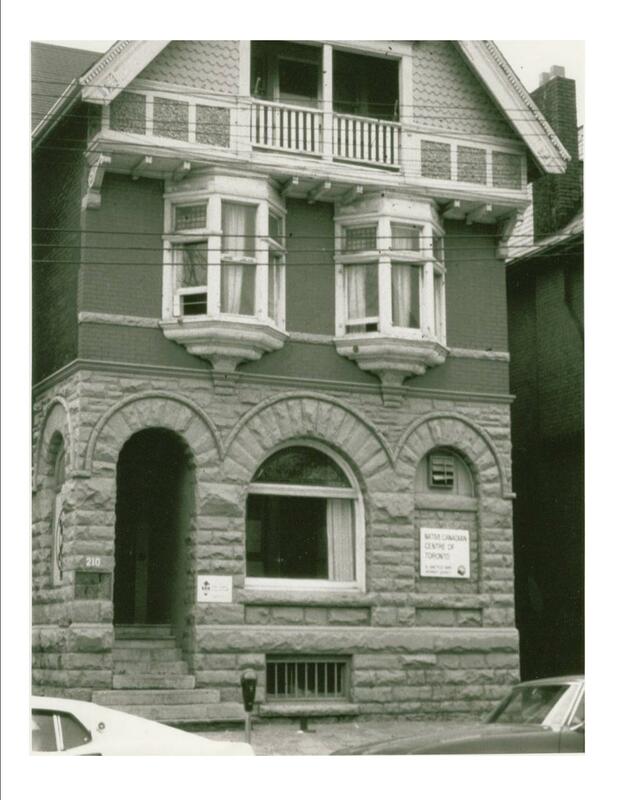 In January of 1963, the Centre’s first location was rented at 603 Church Street. 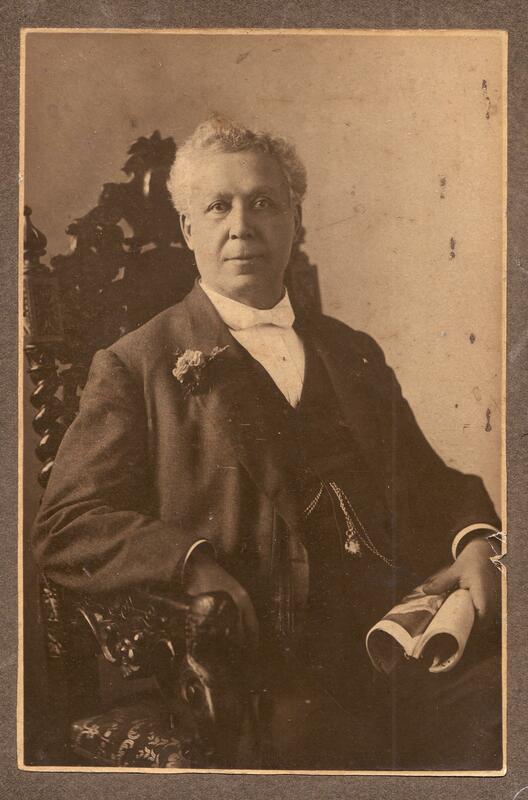 The Department of Citizenship and Metropolitan Toronto provided limited funding and the Centre relied on donations from churches, individuals, foundations and their own fundraising activities. 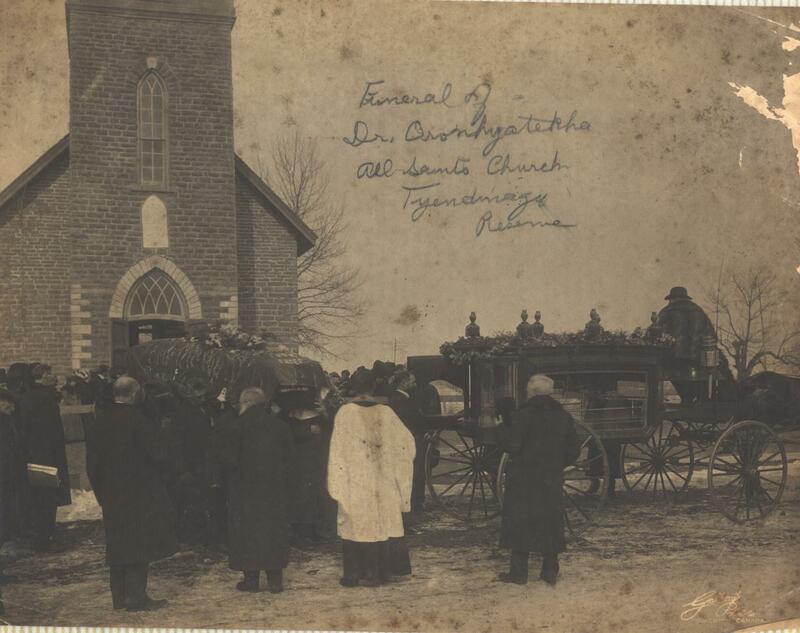 To sustain themselves a Ladies Auxiliary was formed by the volunteers who became essential in much of the clubs fundraising as well as organizing many of its social services such as hospital visits, translation services, prison inmate visiting, and craft making and selling. On October 12, 1963, the centre opened for its first all day operation, which has continued ever since. During this first year of operation the logbook showed that over 6,000 Native people had passed though the Centre. By 1964-1965 the logbook had 10,000 people partaking in the Centre’s programs and activities followed by 16,000 the next year. It was obvious that the Centre had outgrown its first facilities. As a result, the board members set out some new goals: to purchase a new building for the Centre’s evolving programs and staff and to find a more stable source of funding. The Centre was able to purchase their next location at 210 Beverly Street, a three-story home, with the help of generous donations from citizens. 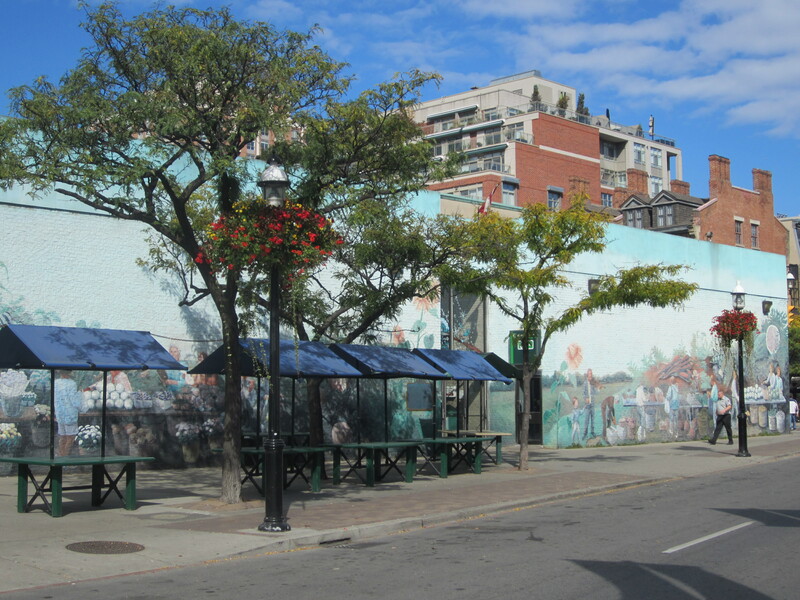 The Centre relocated to Beverly Street in March of 1966; that same year they joined the United Way, officially becoming a registered charity in 1967. The NCCT’s Beverly Street Location. During the Centre’s expansion, it was found that there was a need for the Aboriginal community to have access to cultural specific services through the Centre, rather than the Centre acting as a referral agency for the city’s services. The Centre became an incubator for many of Toronto’s Aboriginal Resources that are still growing and helping the community today, such as Anishnawbe Health, Aboriginal Legal services of Toronto, Native Child and Family Services, Wigwamen Housing Corporation and more. 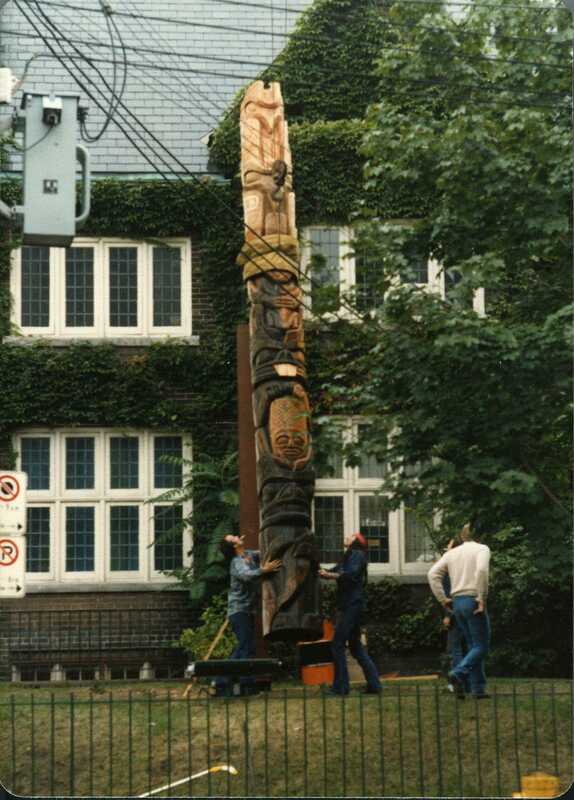 In February of 1972, the Centre underwent an official name change to the Native Canadian Centre of Toronto. 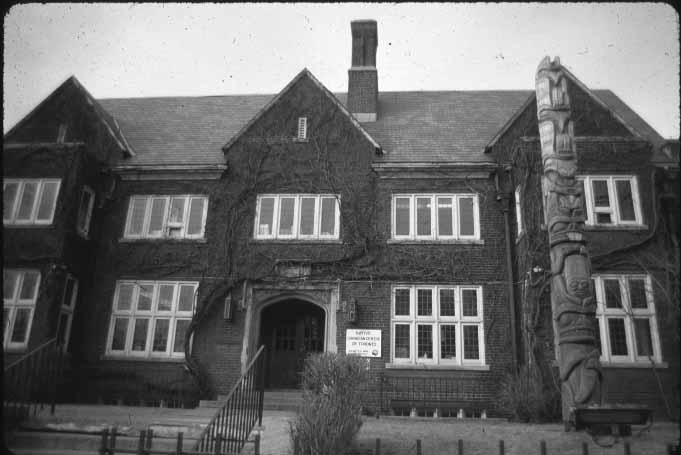 The same year the Centre had again outgrown its facilities at the Beverly Street location, and with the Toronto Aboriginal population reaching an estimated 25,000 people, there was a need for a space to host larger social, recreational, and cultural events. After a three-year search was conducted, the Centre, along with Wigwamen Housing Corporation, purchased the Toronto Bible College as a joint venture. An important fundraising campaign secured the funds for the purchase of the Bible College located at 10-16 Spadina Road in 1976. 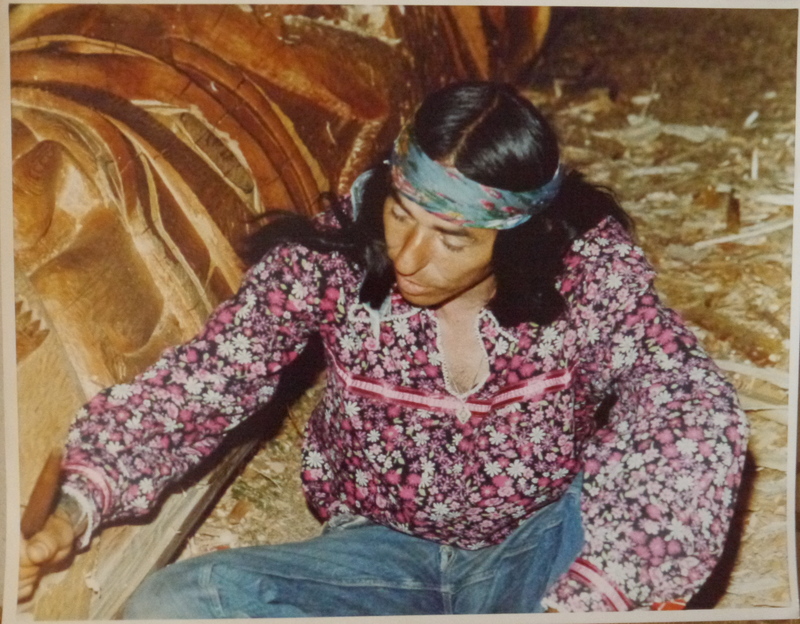 In 1979 Wigwamen Housing opened up a 120-unit Native Seniors complex on the property. 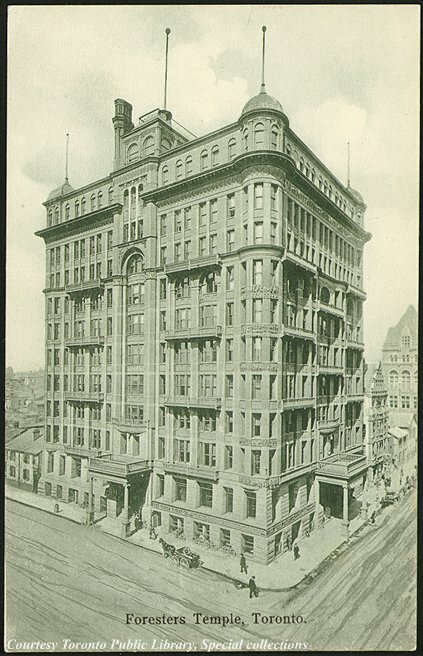 By 1980, the Centre was able to retire the mortgage on the properties by selling 10 Spadina Road to the Toronto Public Library. The library continues to house a large Native collection at this location. The Native Canadian Centre is one of the oldest urban Native community centres in Canada. This non-profit, community based centre has been offering programs and services to Aboriginal people for over 50 years with the help of dedicated individuals and agencies. For more information on the history of the Native Canadian Centre of Toronto, “The Meeting Place Aboriginal Life In Toronto” book is available for purchase at the Centre’s gift shop, the Cedar Basket. Click here to go to the NCCT website.